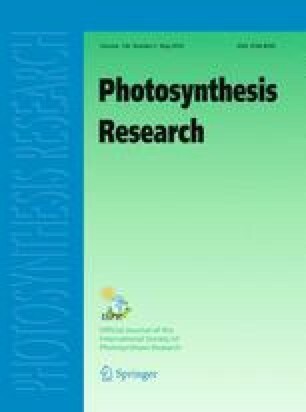 The mechanism of excitation energy distribution between the two photosystems (state transitions) is studied in Synechocystis 6714 wild type and in wild type and a mutant lacking phycocyanin of Synechocystis 6803. (i) Measurements of fluorescence transients and spectra demonstrate that state transitions in these cyanobacteria are controlled by changes in the efficiency of energy transfer from PS II to PS I (spillover) rather than by changes in association of the phycobilisomes to PS II (mobile antenna model). (ii) Ultrastructural study (freeze-fracture) shows that in the mutant the alignment of the PS II associated EF particles is prevalent in state 1 while the conversion to state 2 results in randomization of the EF particle distribution, as already observed in the wild type (Olive et al. 1986). In the mutant, the distance between the EF particle rows is smaller than in the wild type, probably because of the reduced size of the phycobilisomes. Since a parallel increase of spillover is not observed we suggest that the probability of excitation transfer between PS II units and between PS II and PS I depends on the mutual orientation of the photosystems rather than on their distance. (iii) Measurements of the redox state of the plastoquinone pool in state 1 obtained by PS I illumination and in state 2 obtained by various treatments (darkness, anaerobiosis and starvation) show that the plastoquinone pool is oxidized in state 1 and reduced in state 2 except in starved cells where it is still oxidized. In the latter case, no important decrease of ATP was observed. Thus, we propose that in Synechocystis the primary control of the state transitions is the redox state of a component of the cytochrome b6/f complex rather than that of the plastoquinone pool.